Thanks for letting me know! It would have been awesome to have a link or any credit… but I’ll still take it as a compliment! Thank you so much and hugss! Thanks so much for sharing your cake! You did a beautiful job, and congratulations on your wedding! the swirls hold up like yours if I use cream cheese frosting? 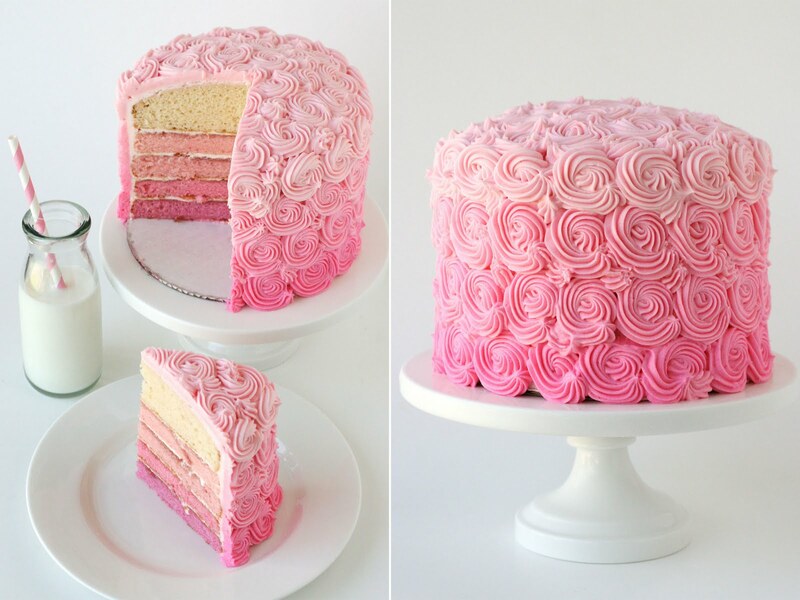 I love your rose cake and i would like to ‘steal’ your ideal for my friend’s birthday!! 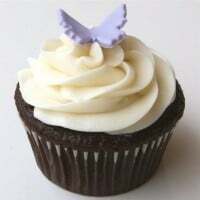 I have one question, regarding the American buttercream frosting, will it last long? Because i would travel about 100+km to her place and our country was hot and humid (South East Asia). Yes, please feel free to use this design for your cake. If you do post an image on-line (facebook, blog, etc.) please include a link back to my site for the idea. Traveling with cake is always tricky, but I think it could work. After you frost the cake, put the whole cake in the fridge, or freezer for the icing to really set up firm. If possible, you could put the cake in an ice chest. Also, when you arrive at the party, you may want to put the cake in the fridge to cool off a bit if it has gotten quite warm. Best of luck! For the frosting, must it be that much icing sugar? Or i can substitute with other ingredient? I just loooove for work, and I am definitely trying this cake ! Good luck,keep on surprising us ! 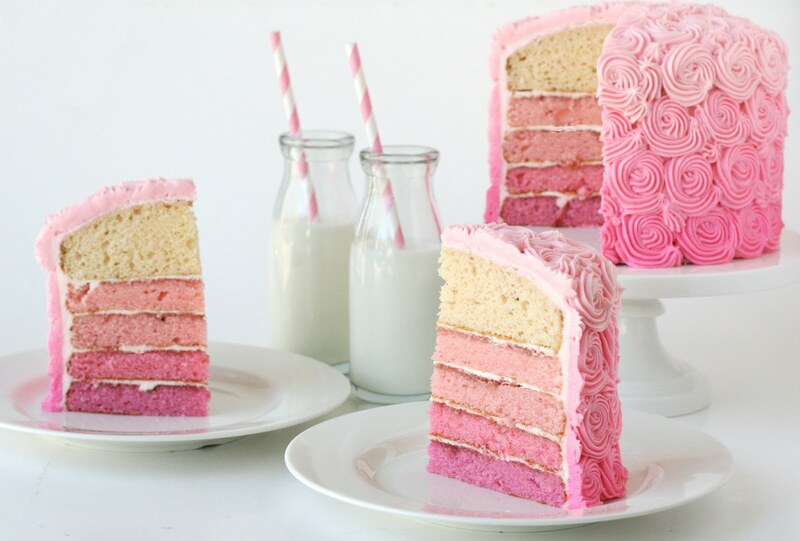 Hi.. I’m very excited that I’m going to make this cake for my daughter’s 1st birthday. Her name is Rose and I’m sure I cant bake anything better than this. It was love at first sight!! 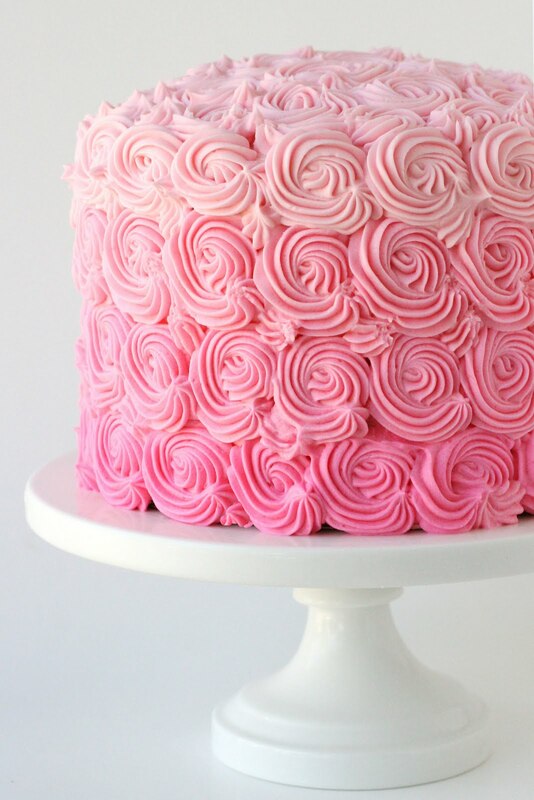 Please can you tell me if its possible to make this type of a cake to feed 35 guests. What’s the maximum number of layers I can try without making it difficult for cutting. This will be first attempt in making a party cake..hope it turns out well!! I am french thank you so much for the advices. Perfect look everybody loved it. I have made it in blue too but the ombre layered turned into green and not blue. Why? That cake is so beautiful and with your instructions, I feel like I could try it. Would you please share where you got the pedestal and plates shown in the photos? Thank you so much! you are so amazing!!! i just found your page and i’m so stunning!! 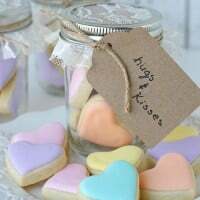 love your recipes very much!!! .. i really have to try them!! and your photos are also amazing!! love the style of your website and everyhting !! I really admire you!! I am 16 and I love baking and decorating! 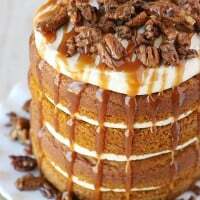 I will try to make this cake tomorrow. The recipe seems easy! I hope it turns out good! Thank you for your recipes! I’ve made this cake 2 times and am making my 3rd today. I’ve made purple and blue and this will be the first time I do pink! It’s for a baby shower and its going to be perfect!! I also use almond extract instead of vanilla. The second time I made the cake I was out of vanilla and did not have time to go to the store so I used almond. It was perfect! It gives it a different flavor and makes it unique! when you mentioned cake pan, it is non sitck ? Hi Valerie, I do not use non-stick pans, but you may if you like. I prepare my pans by lightly coating the pan in butter or oil, then sprinkling a bit of flour in the pan, shake all around, and dump out any excess. I would also recommend lining the bottom of the pan with parchment paper. Is the top layer thicker than the rest of the layers? If so, did you add more to that cake pan? Yes, in this case the top layer is thicker, but that was an accident more than anything. 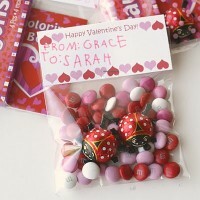 Ideally, each layer should be very close to the same height. I just found out about this site,(via a Dutch site named beautygloss.nl) and I immediately loved it! And I’m sure I’m gonna try to bake this cake one day, thanks for the inspiration! I love these recipes and the images of the cakes are beautiful. I wondered if I could post the picture of the pink cake on the sidebar of my blog, as long as there is a link connecting back to your site. 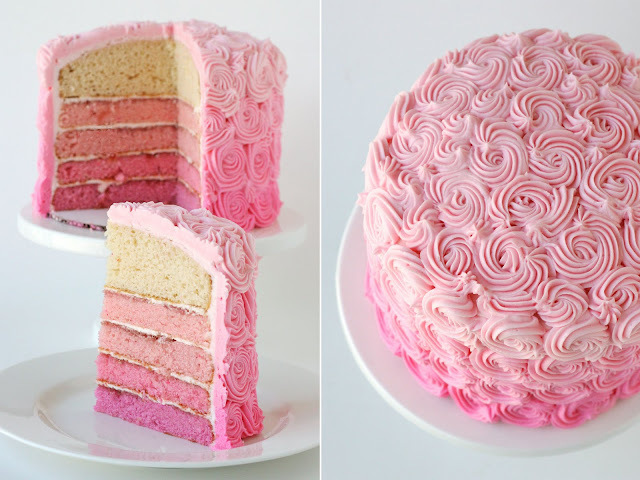 My blogging identity is tied into cake and my blog site is pink, so I like to put images of pink frosted cake there. I will definitely try this recipe! Please let me know if this would be okay. Hi Sandee, So glad you like my cake! Feel free to share one image as long as there is a link back to my post.